A good fitness plan these days relies on good data. For most runners, that means having a watch that tracks fitness data, maps your runs via GPS, measures other metrics, and can withstand the elements. 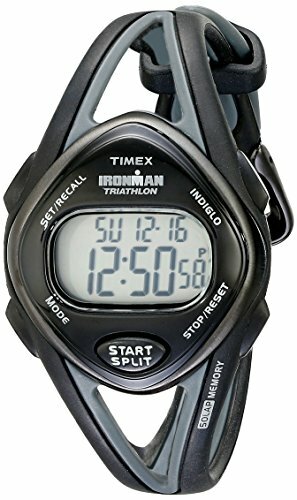 A good running watch will last a long time, and if it’s made well, it will be able to handle anything you can throw at it. Finding a good watch, however, isn’t always easy, and knowing which features you’ll actually use is even harder. While a good watch is a good watch no matter who you are, women who take their fitness seriously might be looking for something different in a watch than men are. A little bit of knowledge can take the guesswork out of shopping for the right watch. 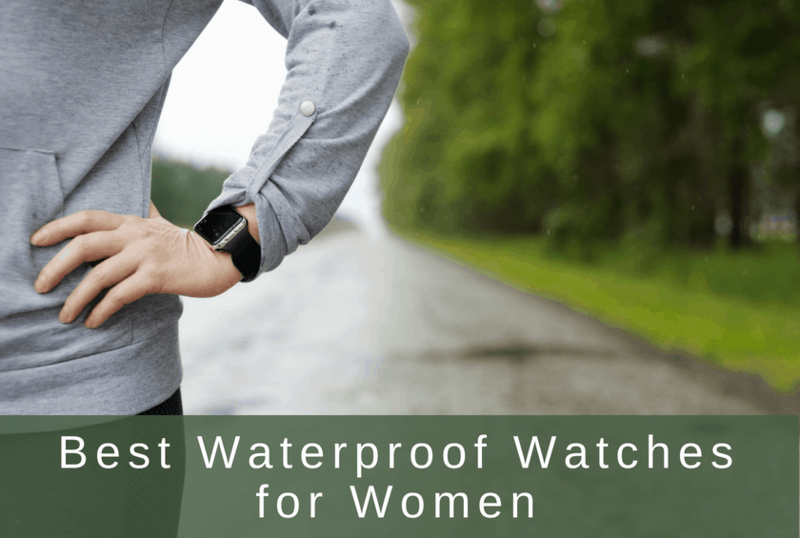 Below, we’ll cover the best waterproof watches for women, and we’ll list all the key features that come with each model. Timex is a name that resonates with watches in general, so it should be of no surprise that they continue to offer great watches. The Ironman Sleek 50 sets a bold statement. Its modern design with sporty undertones is held together by a polyurethane strap that allows for excellent ventilation and flexibility. As part of its name implies, the sleek design will fit comfortably on a slender wrist without inhibiting movement or looking too bulky. Aside from its design elements, the Sleek 50 has an easy to use push-button format that gives its wearer easy access to all features. And thanks to the INDIGLO function found in Timex pieces, you can see your digital display easily at night. Keeping track of your workouts with this watch is made easy thanks to the training log that records workouts by date, best lap times, and the total time you were exercising. If you don’t need GPS, the Sleek 50 is an economical yet rugged option. 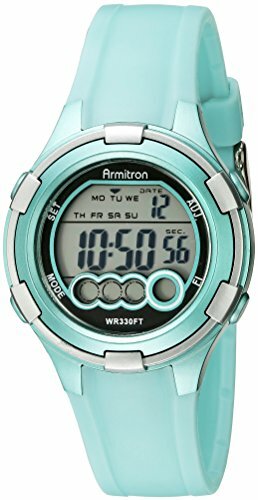 If you need a watch that does it all, Armitron has designed one that will meet your needs and more. The 7053LTG starts off by presenting a brilliant 36-millimeter display that’s surrounded by a metallic green casing that brings style and durability to the watch itself. The band is made from a soft-touch resin that stays comfortably in place throughout the day. While being able to support dual time zones, the watch’s display shows the hour, minute, and second as well as the day and the date. You’ll have access to three alarms which are easy to set, and it comes with a lap timer to help those who wanted to establish a new personal best. All of the display features are visible at night thanks to the Armitron backlight feature. 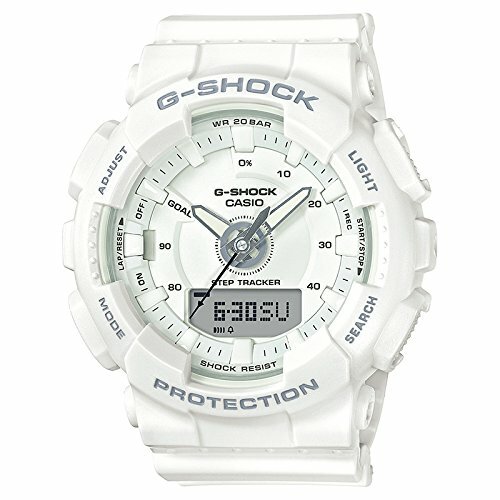 And you’ll be safe hitting the deep end of the pool with it on, as the watch boasts water resistance up to 100 meters. Consumers were generally happy with the features. The Timex Classic 30, in the mid-size, is valued as a fan-favorite for runners and sport-watch enthusiasts alike. It’s a well-designed workhorse with a very robust and durable design, yet it’s modest enough to wear outside of the workout. 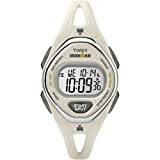 This watch carries a 30-lap memory recall paired with a lap counter that records up to 99 laps, and with on-the-fly or split recall, you can check up on your workout almost instantly. You’ll have access to fully customized alarm settings and countdown timer. You can take your watch with you on your swim workouts – the Classic 30 features 100 meters of water resistance. 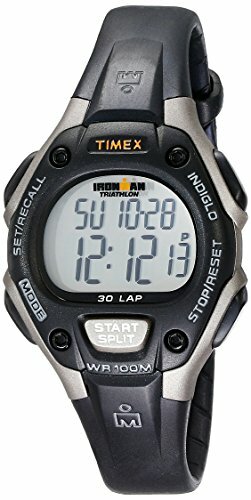 With the Timex Ironman Classic 30, you’ll have access to three-time-zone settings, a 24-hour countdown timer, and three alarm settings that you can set for either daily use, weekday use, weekend use, or weekly use. What sets this watch apart from the others listed is how durable this watch is. It was meticulously tested to be shock-resistant, magnetic-resistant and water-resistant up to 200 meters. You’ll also be able to enjoy the accuracy given to you by the stopwatch features, capable of stopping at 1/1000th a second in accuracy. The slim design caters to thinner wrists, sitting comfortably without hindering any wrist function. It comes with five daily alarms and an hourly time signal. The auto LED light with afterglow allows you to see your watch during any time of the day and with the ability to record up to 29 time zones, you’ll know what time it is anywhere in the world. No backlight for the digital display. Unlike most Garmin watches, the Vivoactive 3 took a step away from the more industrialized look and instead replaced it with a modern, sleek design. 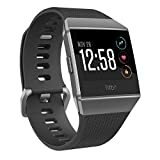 This watch is functional for a large variety of workouts while staying smooth enough to wear outside of the gym, and the ongoing stress and sleep trackers monitor your health data twenty-four hours a day. As with most Garmin watches, this model also comes with a wrist-based heart rate monitor and a very comfortable and durable strap. Garmin’s GPS system is unrivaled, and because of that, you’ll be able to keep track of indoor and outdoor activities without any lapses from the signal dropping. The base model doesn’t support music. However, if you upgrade, it will support music through the iHeartRadio app and can store up to 500 MP3 files of music. Tracks an extensive list of activities. 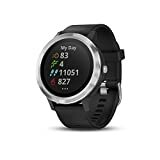 Great GPS and Heart Rate Monitor. Can’t choose which apps get alerts. iOS users can’t respond to texts. The Fitbit Ionic is the first in their line to look like a standard watch rather than a slimmer wrist-based fitness tracker. The Ionic comes with either a plastic or leather strap that can be interchanged easily, holding in place a square 384 x 250 LCD display. The display itself can reach a brightness level comparable to the Apple Watch 2 – easily visible even on very bright days. The touch screen allows you to cycle through the different app choices with a swiping motion. For those who would prefer other methods, there are buttons on the side that would enable its wearer to cycle through apps just as quickly. The Ionic is capable of tracking activities such as running, cycling, swimming, weights and so on. It even comes with its built-in workouts for you to either include in your routine or starts out with. 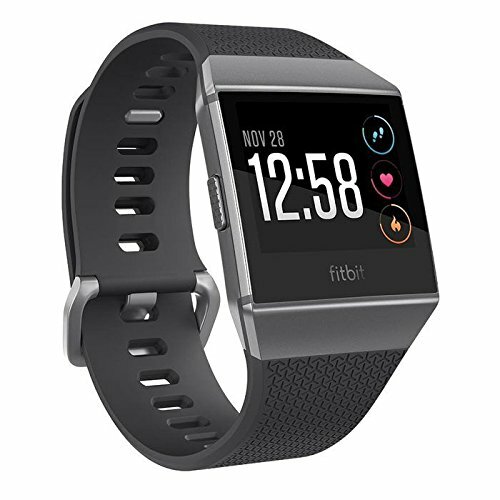 As per Fitbit’s nature, there is a built-in heart rate monitor that provides accurate measurements and a spot-on GPS feature to map where your workouts take you. The Garmin Forerunner series has produced some amazing watches, and the Forerunner 35 is no exception. 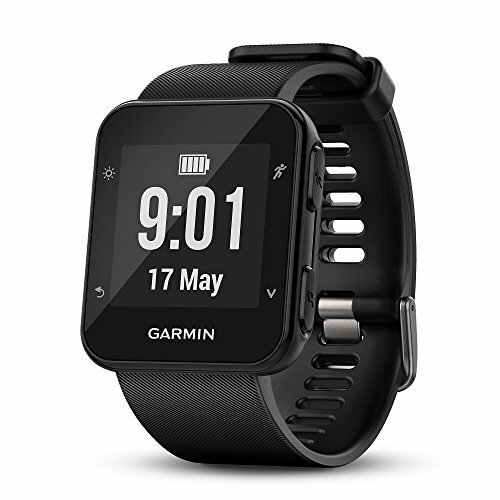 This model stays away from the more rugged and industrial design of the higher-end Garmin models, and instead provides a sleek, modern design that doesn’t inhibit the wrist’s range of motion. You’ll be able to track a lot of things concerning your fitness, such as your heart rate, heart rate zone, and calories burned. With the built-in GPS, your watch will be able to track speed, distance and location to give you the most accuracy on your workout. And once you get all your stats, you can upload them to Garmin Connect or other fitness apps such as Strava to compare your gains with friends and family. You’ll receive a vibration alert any time a new notification pops up. Anything from text messages, activity tracking, pacing progress, and milestones reached will prompt these alerts, and they display nicely so your exercise won’t be disturbed. This watch is also waterproof up to 50 meters, but unfortunately, it isn’t designed to track swimming activities despite this feature. The software has compatibility issues with some phones. 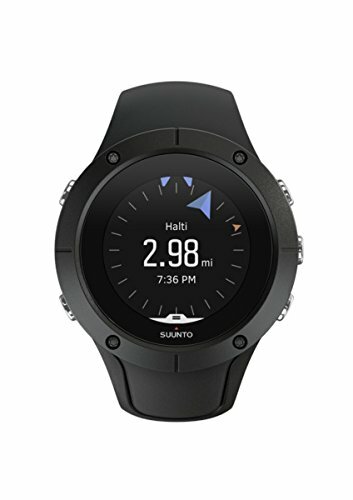 Suunto’s newest model, the Spartan Trainer, is a sleeker version of the Spartan Sports, made for thinner wrists and individuals who prefer a lighter watch. The 218 x 218 resolution screen shows a large variety of options that come with the watch. One thing that many people noticed right off the bat is that the heart rate monitor is impressively accurate. The GPS is also valid, capable of mapping out your route and giving you insight on where you did your best and where you struggled more. The Spartan Trainer also uses downloaded maps to provide you with the best running routes. This is useful when running in a new area. The battery impressively holds a charge for about three to four days with consistent use, all while covering a large variety of activities. The app isn’t the best, but if you’re willing to be patient with it, you’ll have access to all of your fitness data within a few moments after your workout.